We start off with a recap of season 2 especially why this episode is called “Aruba” and it is the place that Mick had wanted to go after one of their time travel adventures. Unfortunately, Aruba will have to wait for Mick as the team are still in Doomworld. Rip has gotten the Waverider up and running but unfortunately discovers that the Legion have used Ray’s suit to shrink the ship. Rip makes his way out of STAR Labs and eventually makes his way to Nate’s mom’s basement. The team make their way back to STAR Labs and split up to find Ray’s suit. Ray and Jax find the Atom suit but Darhk finds them too and uses his magic to try and stop them. Rip comes in the Waverider and opens fire on Darhk but it does nothing. Luckily Mick comes by and knocks Darhk out. Ray unshrinks the Waverider and the team head into the temporal zone. Sara tells Rip that the team have decided to return to 1916 to ensure the Legion don’t get the Spear of Destiny so Doomworld doesn’t happen. Rip warns Sara of the dangers of them going back to a time that they participated in. Sara thinks the risk is worth it and has devised a plan to grab the blood of Christ while the other them are off to the church. From here on end, I am going to call the 2017 Legends as Team Doomworld and the 1916 Legends as the Legends. Doomworld Sara and Doomworld Rip are watching as Doomworld Ray in his Atom suit making his way to No Man’s Land. Ray unshrinks and retrieves the blood of Christ. Unfortunately, Thawne arrives from the Doomworld reality and grabs and destroys the blood of Christ. Also, Thawn rips Ray’s heart out and he drops dead. Team Doomworld is forced to regroup and decide to steal the spear from themselves. Mick still wishes they would all go to Aruba. Mick leads the mission with Rip and Nate while Sara and Jax keep watch. Doomworld Mick, Rip and Nate encounter Legend Sara. The Doomworld men lie and say their trip to the church was a bust. Rip goes to take Gideon offline while Nate goes to the Waverider library to find info on another way to destroy the spear. Mick goes off to find the spear. Meanwhile, Thawn finds the Legion to tell them that the Doomworld Legends have arrived and Snart, Merlyn and Darhk are tasked to stop them. Back on the Waverider, Doomworld Nate sees Amaya and stops in his tracks. Amaya wonders why Nate is looking at her and wonder why he is back from the church. Nate tells Amaya, Legend Jax and Martin that it was a bust but he knows where to find the knight’s artifact: the Galapagos Islands in 1984. Doomworld Mick and Rip have the spear but wonder where Nate is. Nate does come and tells the two that he got distracted. This distraction actually allows Team Legend to come back. Doomworld Sara and Jax has to tell the Doomworld men that they have to stay put. Doomworld Sara and Jax try and distract Team Legend saying there is a radiation leak on the Waverider. However, things go sideways when Legend Sara talks to Legend Ray with Doomworld Sara right in front of him. Legend Jax realizes that Doomworld Rip tinkered with Gideon. Team Legend thinks that the Legion have disguised themselves as Team Doomworld so they start to fight each other. When Doomworld Sara gets knocked out, Rip sees that this is really Sara but from another time. Team Doomworld and Team Legend are both on the Waverider. Doomworld Sara explains what has happened and Legend Sara doesn’t understand her decision and walks off. Doomworld Sara follows. The two talk and come to an understanding to complete the mission. Doomworld Nate talks to Legend Nate to get him to admit that he is in love with Amaya and should tell her. Legend Nate doesn’t know what his Doomworld counterpart is talking about but Doomworld Nate tells Legend Nate about Amaya dying in his reality. 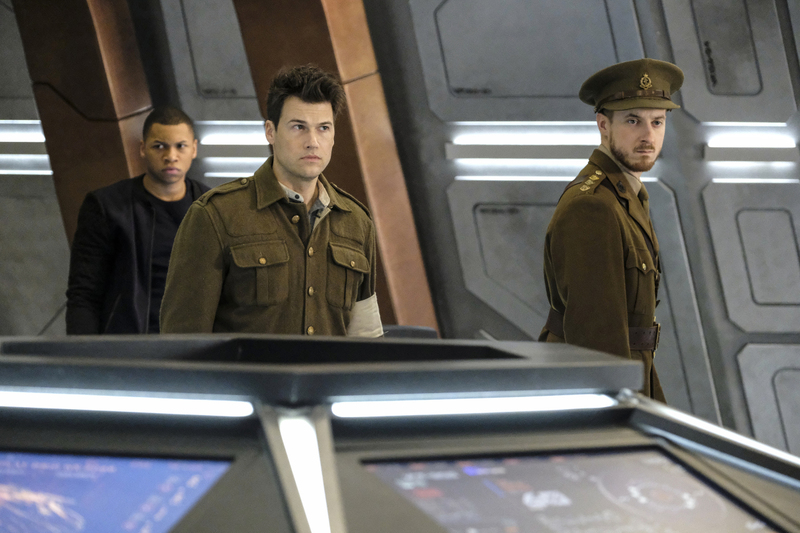 The Waverider experiences a time quack because the teams are interacting with themselves and to make matters worse Snart, Merlyn and Darhk are firing on the Waverider. So Legend Sara decides to time jump to get away but create a time storm and they crash. Both teams decide that Team Legend need to make their way to the Doomworld Waverider with the spear. Team Doomworld knows they are the time aberration and knows if successful they will disappear. The Legion come and Team Doomworld fight them off. Merlyn shoots down Legend Firestorm and is about to deal a death blow to Martin, Doomworld Jax gets in the way and is killed. Doomworld Mick is about to kill Darhk when he is confronted by Snart who calls him partner. Mick says he has no partner but a team. Snart calls him soft. Snart eventually uses his cold gun on Doomworld Mick killing him. Doomworld Nate fights Darkh and he gets killed by Darhk’s sword. Amaya rushes to his side and we hear Doomworld Nate to not be a douche but he was talking to his Legend self. Nate promises he won’t. Legend Sara fights Darhk and wins thanks to an assist from Doomworld Sara. Legend Sara doesn’t kill Darhk but takes him captive. The Legends and Doomsworld Sara make their way to the Waverider but Thawn has arrived with a whole bunch of his other Reverse-Flash selves. Each of the speedsters knock out the Legends and Legend Sara has the spear who is encouraged to use it. Sara at first wants Amaya to use it. Sara thinks she has too much darkness in her but Rip encourages her to do it. Sara starts her enchantment and the spear starts to glow and we are now in the Lance living room. Laurel comes with two glasses of red wine ready for movie night. Sara realizes that this isn’t real. Laurel agrees that it isn’t. It is Laurel’s words that get Sara to believe in herself and what she needs to do. When Sara comes back to reality, Thawne grabs the spear but it doesn’t work for him because Sara neutralized the spear. Black Flash comes for Thawne and he disappears from existence. Doomworld Sara is happy for Legends Sara and just before she is erased gives her parting words “Legends never die”. Now that everything is back to normal, Merlyn is returned to his crappy Star City apartment in 2016 before Thawne recruited him with his memories erased. Mick returns Snart to Central City 2014 and tells him that being part of the Legends made them better men. Mick erases his memories and takes off. Sara leaves Darhk in Miami 1987 and erases his memory. Back on the Waverider, it looks like Amaya is going back to 1942 but she decides to stay on the Waverider and be with Nate and her destiny with just have to wait. But we do get a goodbye and I am not too happy with it because it means with lose Arthur Darvill. Rip leaves because the Legends have been better without him and Sara has been a great captain (agreed). The Legends are ready for their next destination and Sara asks Mick where they should go. Mick chooses Aruba 2017 but they don’t get there because of another time storm. The Legends end up in Los Angeles 2017 but it isn’t what they expect. We see futuristic skyscrapers and parts of Victorian London and also dinosaurs are roaming the streets. So that ends season 2 of DC’s Legends of Tomorrow. The show definitely was much bettter in season 2 and it will be interesting to see what season 3 is going to look like.